The accelerating rate of mobile usage is not a trend. It’s certainly not going out of style. Mobile best practices need to be hard coded in the DNA of every brand, dealer, and marketer – guiding your digital strategy from this very micro-moment on. No longer is mobile marketing a segment or part of your approach, but rather it should dominate your approach, and that’s huge. We’ve been watching consumer behavior in the retail segment for years. The Automotive industry is following in the tracks of larger retailers like Target, Home Depot, and of course, Amazon. This mobile-driven shopping behavior is rapidly translating from buying a T.V. at Best Buy to purchasing a vehicle at a dealership. “Showrooming,” or shopping on other dealer’s sites on a mobile device while physically at a dealership is an increasing problem that needs to be handled proactively. If consumers are going to compare prices on their smartphones for a $20 item or an $800 item, the probability is even stronger that they’ll do the same for a $40,000-$50,000 item while on a dealer’s lot. We’ve been in the space long enough to know that with all up-and-coming technologies come growing pains. The following are the top three ways to own mobile and avoid the problems that other marketers have faced. 1. Ensure You Have Access to Accurate, Real-Time Attribution Reporting: According to AdRoll’s State of the Industry, 41% of U.S. marketers said the lack of attribution transparency was one of the biggest, if not the biggest challenge of mobile advertising today. The ultimate goal for dealers and OEMs is to choose a vendor that has the ability to attribute every sale and every showroom visit to a single campaign at nearly 100% effectiveness, regardless of the device or media channel that led them to you. Leverage technology that knows the exact coordinates of every franchise dealership in the country, so you can pinpoint the exact location of a customer at a nearby competitor. You can then target with highly specific and dynamic messaging, giving you the control to conquest other brands and more importantly, protect your own backyard. Dealers cannot possibly do this by themselves. Unite technology with intelligent data that executes well and has the attribution reporting to prove it. 2. Eliminate Extra Steps: Digital marketing can get complicated when you break down all the moving pieces that make up a comprehensive, synergetic strategy. With mobile, it’s actually quite simple. Think of a single goal your mobile campaign must accomplish. For most, it should be to get a buyer into your showroom. Then, map out the easiest, most straightforward route to get there. The less pages, forms, and steps your audience has to navigate through, the higher the chances of conversion. According to eMarketer, over one-third of advertisers say users or consumers not converting on mobile is yet another challenge. Friction is the enemy here. If a customer gets “stuck” either waiting for a page to load or navigating through irrelevant content they will move on faster than you can say Ferrari. Always put both speed and simplicity into play when it comes to increasing conversion rates on mobile. Focus on one goal, one call to action, and one destination – your dealership. At the end of the day, great marketing is really about one thing; and that’s relating to people. With all the information, analytics and tools available to us, we’ve perhaps created an overly complicated, multi-faceted, omnichannel approach of simply trying to relate to people. The evolution of mobile is much more simplistic than that. It’s just about connecting with people on another level (that happens to be in their pocket, purse, or in their hands roughly 99% of the time). Mobile usage rates have already exceeded desktop. Try not to blink, because before you know it, over 90% of showroom traffic will be attributable to a mobile device. So rather than being reactive, you better be there, and be ready. Click here to read the new Mobile eBook, Auto Dealers and the State of Mobile Marketing 2016. Consumers have been showrooming in retail stores for quite some time now and, while many retailers don’t like it, they’ve pretty much resigned themselves to the fact that it’s going to happen. However, one surprising argument posted in an article by speaker, trainer and consultant, Bob Phibbs, went so far as to make the claim that showrooming is akin to stealing. In his article, he explained that while consumers conduct a large part of their research online, they still love to touch, feel and physically look at products, which they cannot do on the Internet. His viewpoint is that retailers spend tons of money to have nice stores, great product displays, staff and inventory. Then they see consumers come in with the express intent to research the product they are interested in, just to leave and buy it for a better price elsewhere, or online. Isn’t this being a little small minded about where commerce is truly headed? To be successful in business we must all be willing to change and adapt with the times to some degree, or get left behind. 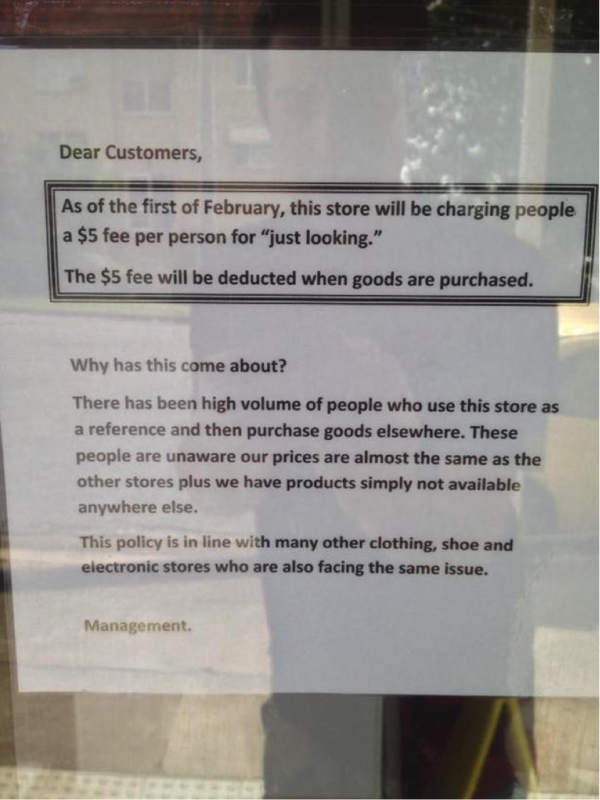 This extreme measure by the retailer will probably serve to deter more business than it gains. Can you imagine having this in your car dealership? Wouldn’t it be better to provide free Wi-Fi, and a great shopping experience and win customers over while they are at your dealership, rather than drive them away with unfriendly business practices? The fact is that showrooming is here to stay -- it has become a natural part of consumer shopping behavior. Rather than trying to fight it, it perhaps makes more sense to explore ways to embrace it and use it to our advantage. Think about it, the bottom line is that this practice could actually be driving MORE leads into your dealership, if you’re competitive in the marketplace. Perhaps the point is how you handle these leads once they arrive.